The Good Film Co. is a video production firm that creates video content for clients on both local and international scales. 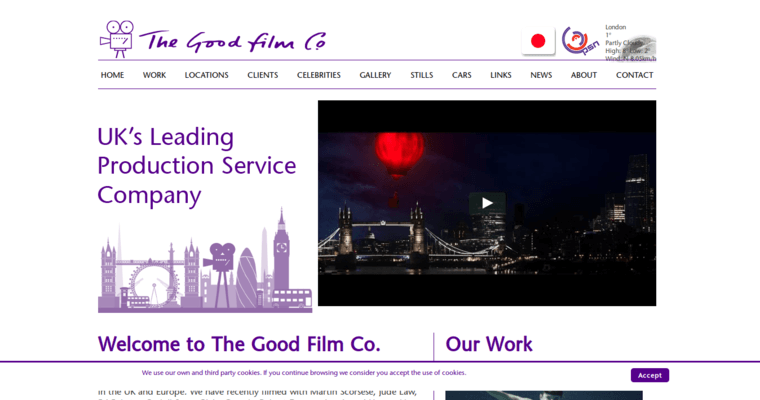 The Good Film Co. has a division branch in Beverly Hills as well as in London and works as a create multimedia video production service that has been in business since 1988. The company is known for being able to film projects overseas and understands it can be costly, which is why they offer strategic plans for filming with those clients who have a knack for wanting to include important locations in their work. The agency has had the pleasure of working with all kinds of celebrities, athletes, music artists and actors, such as Billy Zane, Andy Serkis, Henry Cavill, Armie Hammer, Charlize Theron and even Robert Downey, Jr. The Good Film has also worked with big name clients such as Disney, Netflix, HBO, Volvic, Pepsi, Toyota and Cinemax.